You might know that a cochlear implant uses electrical pulses to send sound information to the brain. But, do you know how sound information is sent to the brain in normal hearing? How does the ear work? It’s also with electrical signals! Wait, then what’s the difference between the electrical signals from a cochlear implant and those from normal hearing? Is there even a difference? The answer is: no, not really. Once the electrical signals reach the auditory nerve, they’re treated exactly the same no matter what their source was. They are all relayed to the brain, and they are all perceived as the sense of hearing. The brain, rather than the ear, is what’s really responsible for perceiving sounds. The cochlea, and actually the whole ear, is designed to convert sounds into nerve signals and convey sound information to the brain. With normal hearing it all starts with sound waves, which are vibrations. These sound waves reach the ear and vibrate the ear drum, which in turn vibrates the tiny bones of the middle ear and these bones then carry these sound vibrations into the cochlea. In the cochlea, the sound vibrations vibrate the basilar membrane. The basilar membrane contains thousands of hair cells that move in response to the pressure from sound waves. Different hair cells respond to different frequencies of sound, and they’re arranged like a piano: cells at the bottom of the membrane respond to high-frequency sounds and those at the top respond to low-frequency sounds. When the hair cells are pushed far enough they create a tiny electrical pulse, sometimes called a nerve impulse, that stimulates the neighboring nerve cell. When a nerve cell receives a nerve impulse, it relays this electrical nerve signal to its neighbor, and then its neighbor relays the signal to the next nerve cell, which stimulates the next nerve cell, and so on down the line. How far does this line go? There are thousands of these hair cells located throughout the cochlea, and each one of them is connected to the auditory nerve. The auditory nerve is a line of nerve cells that reaches all the way to the auditory cortex, a part of the brain. It’s in the auditory cortex where these electrical nerve impulses become what you experience as sound. So, that’s how sound information reaches the brain in normal hearing. What happens when these nerve cells do not function properly? When someone has a hearing loss due to non-functioning hair cells, there are a few different solutions that can help to replicate the sense of hearing. One of these solutions is a cochlear implant, which is designed to replicate the electrical pulses that the hair cells create. This works because nerve cells are just messengers, and they don’t discriminate—if they receive any kind of electrical pulse they send it on without asking questions. Therefore, a cochlear implant can still send sound information, even if the hair cells in the cochlea aren’t functioning properly. Once the electrode array is inserted into the cochlea, it is close enough to the nerve cells that it can send them electrical signals. That’s why there are multiple contacts in an electrode array: different contacts are located along the cochlea to provide electrical pulses to the areas that replicate a wide range of sound frequencies. When an electrical pulse is sent from the electrode array, it stimulates a targeted region of the auditory nerve’s nerve cells. These nerve cells then relay a natural electrical nerve signal on to their neighbor, and so on down the line until they reach the auditory cortex. So, once these electrical signals reach the nerve cells of the auditory nerve, they are treated exactly like they would be if they were created by the cochlea’s hair cells. Another way to stimulate the brain with sound information is using EAS, or Electric Acoustic Stimulation. EAS combines two different types of stimulation that send sound information to the brain. The first, the electric stimulation that is found in a cochlear implant, is described in the section just above. The second is acoustic amplification, like a hearing aid, which amplifies the sound waves which then follow the path of normal hearing as described in the first section. This type of dual stimulation is designed for someone who has very few functional hair cells in the high-frequency region of the cochlea, but some functional hair cells in the low-frequency region. The cochlear implant’s electric stimulation sends sound information to the nerve cells that don’t have working hair cells, while the acoustic amplification sends sound information to the hair cells that are still functional. Because these two types of stimulation both create electrical pulses, the auditory nerve cells react to both types of stimulation in the same way. Just like in normal hearing, the auditory nerve relays the electrical nerve impulses to the brain where the information is perceived as sound. An ABI, or Auditory Brainstem Implant, also provides electrical stimulation to the auditory centers of the brain. 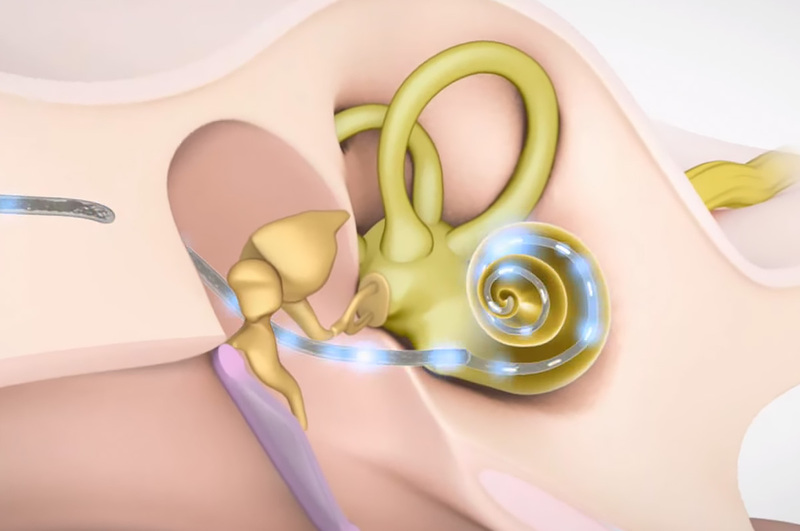 It’s designed for individuals who don’t have a functional auditory nerve, and therefore is attached directly to the brainstem and skips the cochlea entirely. This means that its electrical signals also skip the nerve cells in the cochlea, but are still sent to the brain using nerve pathways. There are differences between an ABI and a cochlear implant, and they’re used in very different circumstances. An ABI is most often used in cases of retrocochlear hearing loss, which can often be caused by tumors around the auditory nerve resulting in a non-functioning auditory nerve. To remove these tumors, the auditory nerve is usually removed, so a cochlear implant isn’t an option in these cases. Because of this, the stimulation has to be directed at nerve cells which are closer to the brain. Actually, the implant is placed on nerve cells that are a part of the brain. Because the nerves here are so densely concentrated, each of the ABI’s contacts stimulates a much larger number of nerve cells than a cochlear implant’s individual contacts would. The ABI’s electrical pulses are still perceived as sound information, but the brain will interpret this information differently from how it would interpret a cochlear implant’s more precisely targeted electrical pulses. If you want to learn more about the hearing losses that these implants can help treat, check out our article here about the different types of hearing loss. Or, if you or someone you know have a hearing loss and want to learn if one of these hearing implant systems could be a solution, contact your local MED-EL representative or leave us a comment below.